Boris Johnson has attacked Theresa’s May’s Brexit plan, saying she had “wrapped a suicide vest” around the British constitution and “handed the detonator” to Brussels. In the Mail on Sunday, the former foreign secretary said the Chequers deal was “feeble” and “pathetic”. He has been strongly criticised by some Tories – one minister said it marked a “disgusting moment” in politics. And Home Secretary Sajid Javid called for “measured language” to be used. Writing in the same paper, the current Foreign Secretary Jeremy Hunt called for people to rally behind Mrs May, backing her to hold the line “in the face of intense pressure”. 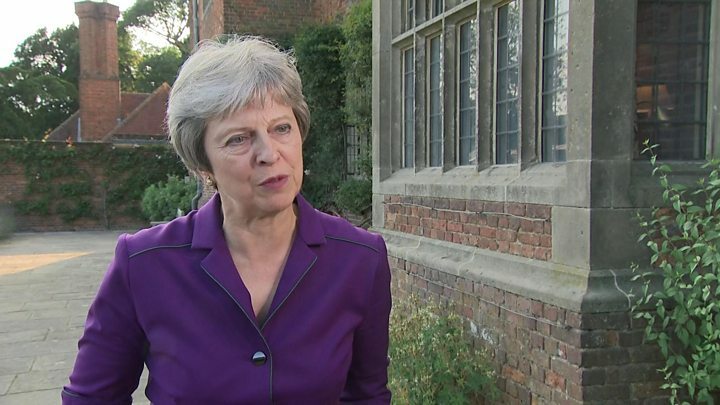 The UK is leaving the EU on 29 March 2019, and the government’s plan – agreed at Chequers in July – has sparked criticism from Brexiteer Tories as well as the EU. In his article, Mr Johnson accused the EU of “bullying” the UK – but questioned why the response had been “so utterly feeble”. He said that rather than getting a “generous free trade deal”, Britain is saying, “yes sir, no sir, three bags full sir”, to Brussels. “At every stage of the talks so far, Brussels gets what Brussels wants,” wrote Mr Johnson. He blamed the “insanity of the so-called backstop” – the commitment by the UK and the EU to come up with a solution to avoid a hard border in Northern Ireland. The BBC’s political correspondent Alex Forsyth said the “scathing remarks” showed Mr Johnson’s “willingness to challenge the prime minister remains undimmed” after recent revelations about his private life. It is Mr Johnson’s second attack on the prime minister’s Brexit strategy inside a week, as last Monday he said the Chequers deal “means disaster” for Britain – Downing Street responded to that attack by saying he had offered “no new ideas”. While Mr Javid voiced measured criticism of Mr Johnson, other Tories reacted more angrily to his remarks. Former Army officer and chairman of the Foreign Affairs Select Committee Tom Tugendhat graphically described the aftermath of a suicide bomb that had gone off near his office in Helmand province, Afghanistan. He said comparing such an attack to the PM’s plans “isn’t funny”, adding: “Some need to grow up”. If this latest broadside was not the end of Mr Johnson’s political career, “I will make sure it is later”, he said. Another Foreign Office minister, Alistair Burt, tweeted: “I’m stunned at the nature of this attack. There is no justification for such an outrageous, inappropriate and hurtful analogy. But backbench Tory MP Nadine Dorries defended Mr Johnson in the face of what she was “vitriol”, saying his critics were “terrified of his popular appeal”. And Tory Brexiteer Andrew Bridgen said the way Mr Johnson “says it how he sees it and speaks truth unto power” was “something that endears him to a huge swathe of the British public”. He backed the Chequers proposals which he said represented “the only deal that we’ve got on the table”. It is the first public comment from Mr Johnson since he and his wife, Marina Wheeler, confirmed they were getting divorced earlier this week. The Sunday Times has reported that Mrs May’s aides wrote a 4,000-word “dirty dossier” on Mr Johnson in 2016, exposing a “catalogue of lurid allegations” against him. The paper says it has seen the document – said to have been written during the Conservative leadership contest – but officials at Downing Street and Conservative Campaign Headquarters have denied circulating it. Elsewhere the National Police Chiefs’ Council said there was no intelligence to suggest there would be an increase in crime or disorder if the UK and the EU cannot agree a deal. According to the paper, the document warned that concerns around medical supplies could “feed civil disorder”, and that potential goods shortages raised concerns of “widespread protest which could then escalate into disorder”. It also warned that the “necessity to call on military assistance is a real possibility” in the weeks after UK’s departure from the EU.